The legendary composer and orchestra leader Percy Faith, who had many best-selling recordings in his own right, as well as working with some of the top recordings artists of the Fifties and Sixties, was actually born in Toronto in April 1908 and started his professional musical career working in Canadian radio – most notably the Canadian Broadcasting Company – before moving to the United States in 1940 when he joined NBC. Faith’s earliest musical ambition had been to work as a pianist but, after seriously injuring his hands in a fire, he turned to conducting and composing. Faith had learned to play the piano and violin as a child and his musical skills came to the fore in the early Fifties when he was appointed by Mitch Miller, the head of A&R at Columbia, to be musical director of popular music for the company. His first big recording success was with a very young up-and-coming Tony Bennett with whom he had three million-selling singles. Later Faith worked with Guy Mitchell whose successes included My Heart Cries For You and Doris Day, another Columbia signing. In his own right, Faith arguably became the pioneer of the ‘easy listening’ genre thanks to hits like Cross My Fingers, All My Love, On Top Of Old Smoky (with vocals by the legendary Burl Ives), Delicado, Where Is Your Heart (from the hit film Moulin Rouge and reached the top of the American pop charts in 1953), and Return To Paradise which was also a big hit the same year. During the Fifties Percy Faith moved into the movies with great success, writing the music for such silver screen hits as Love Me Or Leave Me in 1955, starring Doris Day and based on the life story of the singer Ruth Etting. Later, the Sixties, he composed the soundtrack music for Tammy Tell Me True (starring Sandra Dee), I’d Rather Be Rich in 1964, The Third Day in 1965, and The Oscar the following year. His biggest recording success however was with Theme From A Summer Place, which topped the Billboard Hot 100 in the United States for nine weeks in early 1960. The music for the film, which starred Dorothy McGuire, Sandra Dee, Troy Donahue and Arthur Kennedy among others, had been composed for the 1959 film by Max Steiner. Percy Faith’s recording of the song was released in September 1959 but didn’t enter the American charts until the following January. After a six week climb, it finally reached number one and also became Billboard’s number one single of 1960. Percy Faith died in February 1976 at the age of 67 years but the musical memories live on, and this new collection of Faith favourites includes such classics as Theme From A Summer Place, Moulin Rouge’s Where Is Your Heart, Delicado, And This Is mY Beloved, Under The Bridges Of Paris, Cole Porter’s What Is This Thing Called Love?, March Of The Siamese Children (from Rodgers & Hammerstein’s The King And I), Stranger In Paradise (from the film and stage musical Kismet, and a huge hit for Tony Bennett), and The Syncopated Clock. 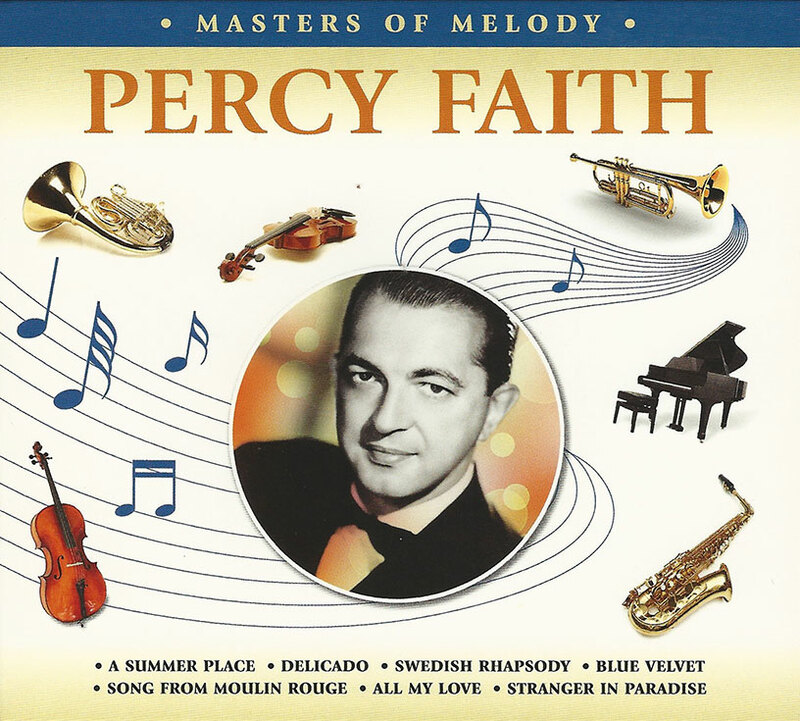 Percy Faith’s easy listening music brought great pleasure to countless millions of fans around the world, via his many recordings, and works in films, television and radio, and this CD is a more than worthy tribute to his enormous musical personality and versatility. There were a few errors in the notes which I fixed (e.g. Percy's age, Mitch "Mitchell" instead of "Miller"). This CD is does not feature licensed recordings and simply takes advantage of European copyright laws. They also included Alan Bunting's edited "Moulin Rouge" creation.